In what is seen as the most exciting development of the year for the expedition cruise industry, One Ocean Expeditions (OOE) has announced that the highly regarded Akademik Sergey Vavilov will join Akademik Ioffe as its second polar expedition vessel with effect from November 2012. The Vavilov has been described by OOE's competitors as 'one of the finest expedition ships to sail the polar seas' and is sister ship to the Ioffe, which OOE currently operates exclusively under a long term charter agreement. Both vessels were built in Finland in the late 1980's for the Russian Academy of Science. Both undertook hydro-acoustic research and consequently are extremely quiet, fast and stable. 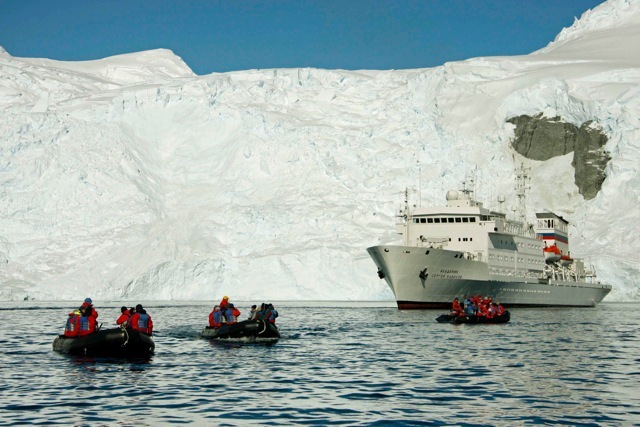 They are widely acknowledged as the best expedition vessels for difficult polar waters. One Ocean Expeditions was founded in 2006 by Canadian Andrew Prossin, a 20 year veteran of Antarctica and the Arctic. Known for his innovative approach to expedition cruising, he has worked extensively with both vessels and it was an obvious fit for his new company to bring these vessels into the fold. "This addition to our fleet was both necessary and timely for OOE", he said. "It is necessary because our 2011/12 season has almost completely sold out and we definitely need a second vessel. It is timely because the opportunity to take the Vavilov now puts us in a leading position with the two best expedition vessels in the world". With a capacity of 105 passengers, (but limited by OOE to 92) the Vavilov will initially be deployed in Antarctica, followed by the 2013 Arctic season. But first, the ship will be extensively refurbished. "The Vavilov is a great ship, and with the forthcoming improvement program we will have no trouble bringing her up to the high expectations of One Ocean Expeditions' clients", said Prossin. "This is a terrific platform where we can offer an innovative expedition product and continue to hone the high levels of onboard guest services our clients have come to expect from us." A major renovation is planned, including redecorated cabins, enhanced, modernised public areas and a wellness centre.